It was wonderful to see a dining legacy in Downtown Pittsfield reopen after being closed for over a year. 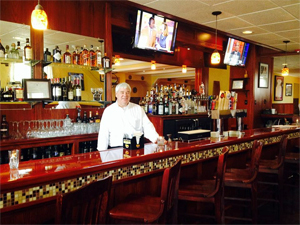 The Rainbow opened its doors once again in November, 2013 and has quickly become a dining favorite with Berkshire residents and visitors alike. We have been several times and the food and service have been consistently impressive. Located on First Street, the Rainbow Restaurant has clearly done a superb job with those attending various activities downtown and with the summer around the corner, they will definitely be a player with area visitors here for the Arts and Entertainment. The Rainbow underwent a major renovation and one of the biggest returns, is the wood-fired pizza, that the Rainbow was so famous for in the past. As I mentioned, we have tried many of their items, both dine-in as well as take-out and the place just seems to get busier and busier. They also offer Online Ordering, simplifying take-out even more. A few of our favorites are, of course the pizza, with the Roast Garlic being outstanding, the Fried Calamari, Macaroni and Cheese (like no other), which by the way is also cooked in the wood-fired oven, Chicken Parmigiana, Greek Salad and Pork Chops, which were served as a Daily Special during one of our visits. They feature a wide selection of Craft Beers on Tap, including a few locals, which is always nice to see, along with some of the better liquors that are often hard to find at other area restaurants. They have Free on-site parking, with additional parking available behind the building next door, with stairs leading to their property. FYI, if you're up for a short, easy walk, the Rainbow Restaurant is a short walk from Barrington Stage Company and a 10-15 minute walk from the Crowne Plaza Hotel. The Rainbow Restaurant is open daily: Sunday through Thursday 11:30AM - 10:00PM, Friday and Saturday 11:30AM-11:00PM.